October 29, 2018 Detroit Tigers activated 1B Miguel Cabrera from the 60-day injured list. 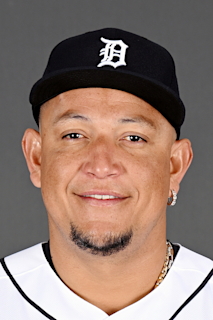 July 3, 2018 Detroit Tigers transferred 1B Miguel Cabrera from the 10-day disabled list to the 60-day disabled list. Ruptured left biceps tendon. June 13, 2018 Detroit Tigers placed 1B Miguel Cabrera on the 10-day disabled list. Ruptured left biceps tendon. June 1, 2018 Detroit Tigers activated 1B Miguel Cabrera from the 10-day disabled list. May 4, 2018 Detroit Tigers placed 1B Miguel Cabrera on the 10-day disabled list. Right hamstring strain. September 9, 2017 Detroit Tigers activated 1B Miguel Cabrera. September 2, 2017 1B Miguel Cabrera roster status changed by Detroit Tigers. May 2, 2017 Detroit Tigers activated 1B Miguel Cabrera from the 10-day disabled list. April 22, 2017 Detroit Tigers placed 1B Miguel Cabrera on the 10-day disabled list. Right groin strain. August 14, 2015 Detroit Tigers activated 1B Miguel Cabrera from the 15-day disabled list. August 26, 2011 Detroit Tigers activated 1B Miguel Cabrera from the paternity list. October 4, 2010 Tigres de Aragua signed 1B Miguel Cabrera. October 8, 2009 1B Miguel Cabrera assigned to Tigres de Aragua.